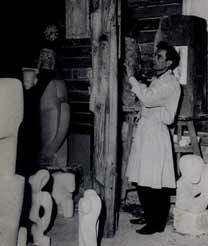 Alfred Basbous believes that the aim of art is to discover the shape; therefore he must overcome thought and imaging to detect the shape up to the ultimate expression. He refuses to give attention to direct expression and in the best conditions, he rejects the external movement. He believes that his role is not in finding solutions and answering questions, but in presenting these issues and asking new questions or even raising old questions in a new language. The conservative artist believes that honesty towards life and nature makes the best art (he refuses the saying that the best poems are just lies). He thinks that the role of the artist is to be pioneer in his society. He is idealistic; he preaches showing the right way with confidence, because he has clear vision to his values, he perseveres in transferring the world even if he fails to do so completely. The art is the reflection of the thought, an image of the reality, and a tangible translation of the values, therefore, it imposes the thought on the material. He eventually hopes that the stone would feel as it has a spirit. (The artist tries to make the stone speaks). various elements of the work with their different material, substance, shape, lines and space. Through such harmony, our unconscious is revealed and we are astonished by the sparkled secrets of the universe. The art of the conservative artist is actually considered the beautiful art while getting closer to the truth whenever consorted with reality and represent it with honesty and integrity, even without the spirit. His artworks reveal their secrets to the observers without keeping them confused trying to interpret it. He depicts the consciousness through his own awareness and consciousness; therefore, the observer does not have to solve its mysteries. 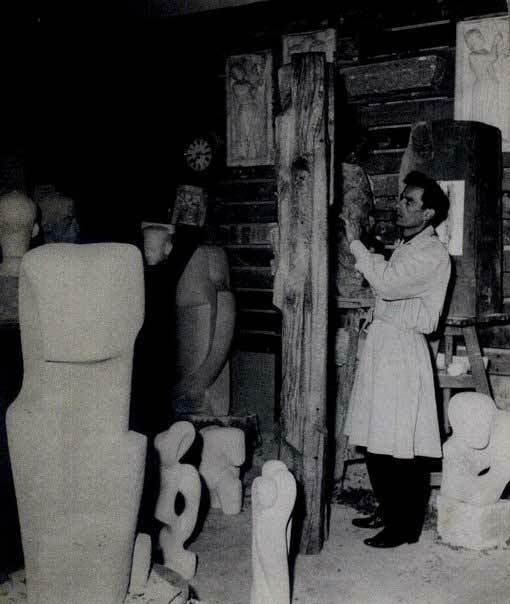 Alfred Basbous sculpted slender shapes, with no sharp angle. Even in his cubic and rectangular structures, joints are always rounded. Sensitive and demanding, he polished the surfaces in the extreme, making them soft and sensual, when he allowed the stone to remain rough; the relief is more welcoming than disturbing. The curves come into dialogue with each other, flirt, intersect, defy or protect themselves. Without suffering from any symmetry, the works of Alfred Basbous breathe nevertheless the balance. They are often provided with openings that take the eye beyond the surface, inside the material itself.